Beginning on February 7th, 2019, thousands of protestors began gathering in Port-au-Prince demanding that Jovenel Moïse, the country’s President since 2017, step down. The protests were held in response to the economic hardship that Haitians have been facing for the past several years, making Haiti the poorest country in Latin America. According to Fintan Monaghan with Al Jazeera, approximately 60% of the population lives on barely $2 per day (Monaghan, 2019). Moïse was elected to the Presidency under a campaign that promised an end to the political corruption that was draining the Haitian economy of funds in exchange for financing the personal expenses of members of the Haitian Government. Since Moïse was sworn into office on February 7, 2017, economic conditions have hardly changed, and no politicians from the previous administration are facing prosecution for their crimes. A week prior to the beginning of the protests, a budget was approved raising taxes on cigarettes, alcohol, and passports (BBC Latin America & Caribbean, 2017). Additionally, foreign aid to the nation has steeply decreased due to Haiti cutting ties with Venezuela due to pressure from the United States. With a steep increase in taxes, and a recent decrease in aid, protestors stormed the streets of Haiti’s capital destroying building windows and setting cars on fire, refusing to leave until Moïse steps down. In response to the protests, Moïse declared that he will not resign because he was elected through Haiti’s democratic process, however, he said the door is open to negotiation with his opponents. Despite Moïse’s comments, protestors remained dissatisfied, and the protests continued for over a week. The protests became increasingly violent as police began using force to keep the protestors at bay. The consequences of the rising tensions between protestors and police resulted in dire consequences. Police forces became lethal, killing at least 7 Haitian protesters, including a youth near the Haitian Presidential Palace (Meyers-Belkin, 2019). At the same time, protests resulted in conditions that induced an environment for a prison break. At the Aquin Prison, protests at the attached police station caused enough chaos for all 78 prison inmates to escape. Haitian prison conditions are some of the worst in the world, with detainees facing. “extremely crowded conditions, poor hygiene, food shortages and a lack of health care” (Telegraph Reporters, 2019). About one third of prisoners in Haiti’s abject penitentiary systems have not yet had a court hearing for their crimes, in some cases, delaying the judicial process for inmates by more than a decade. Poor prison conditions and immensely delayed trials are blamed on the slow justice system— a system that some believe might be improved by the proper management of government funds (Telegraph Reporters, 2019). A task which Moïse agreed to reconsider after more than a week of violence. The weekend of January 15th, Moïse agreed to “reduce certain government budgets by 30 percent, limit the travel of government officials and remove all non-essential privileges they enjoy, including phone cards” (Retamal, 2019). Moïse’s Prime Minister, Jean-Henry Ceant, has also promised to investigate the corruption scandals of the previous administration. Particularly Haiti’s Petrocaribe fund. As a part of the Petrocaribe fund, Venezuela provided Caribbean and Central American countries discounted oil for years, however, many of the countries have reportedly misused about $2 billion from the program. In Haiti, many high level government officials were accused of using these funds for their own personal expenses. Though not President at the time, Moïse himself was the head of the Agritrans company, responsible for reconstructing a road as a part of a push for the rejuvenation of various infrastructure projects. Despite being paid for his role in the road reconstruction, a contract for the project appears to be nonexistent (Marmouyet, 2019). Moïse’s willingness to investigate this scandal among others may be indicative of if Moïse will actually stay true to his promises to remanage the government’s budget or if his claims were simply a ploy to calm the increasingly violent crowds. After the newly proposed budget changes, protesters settled down slowly, and businesses began to reopen, but Haitians are still skeptical. Athena Kolbe, a human rights worker who worked in Haiti has said that “Corruption goes unpunished, and people are just really tired of it… I can't imagine that things are going to calm down” (Retamal, 2019). Drastic changes need to happen in order for Haitians to feel financially stable enough just to provide for their families. Kolbe explains that Moïse were to step down, there would be no change until the country comes up with a solution to address the political corruption. “People are just kind of exhausted with the business elite running the country and retaining control and not knowing where public funds are going” (Retamal, 2019). These “business elite” such as Moïse who are managing Haiti’s government are drastically out of touch with the Haitian people who fall at the rank of 168 out of 188 on the United Nations’ Human Development Report on Human Inequality (United Nations Development Programme, 2018). Haitians are struggling to meet the basic necessities of life and until the nation’s corruption is addressed, Haitians lack faith that anything will change. Fintan Monaghan. (2019 Feb 11). 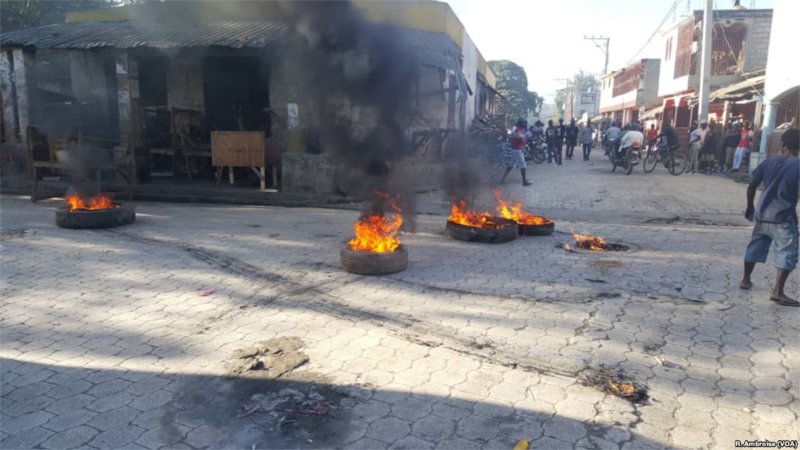 "Haiti: People protest demanding President Moise's resignation". Al Jazeera. Retrieved Wednesday, February 13, 2019. BBC Latin America & Caribbean. (2017 Sept 13). "Haiti protests: Violent clashes in Port-au-Prince". BBC News. Retrieved Wednesday, February 13, 2019. Haxie Meyers-Belkin. (2019 Feb 13). "Several dead, dozens escape prison amid Haiti protests". France 24. Retrieved Wednesday, February 13, 2019. Telegraph Reporters. (2019 Feb 12). "All 78 detainees escape Haiti prison during protest". The Telegraph. Retrieved Wednesday, February 13, 2019. Hector Retamal. (2019 Feb 18). "Haitians seek water, food as businesses reopen after protests". Al Jazeera. Retrieved Wednesday, February 20, 2019. Françoise Marmouyet. (2019 Feb 15). "PetroCaribe Challenge: The campaign mobilising Haitians against corruption". France 24. Retrieved Friday, February 15, 2019. United Nations Development Programme. (2018). " Human Development Reports". United Nations Human Development Reports. Retrieved Wednesday, February 20, 2019.